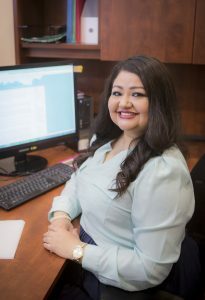 Brenda Cardenas - The Legal Connection, Inc.
Our Values: What is TLC? Brenda, a Texas native from San Antonio, began her career as a Custodian of Record working for St. David’s Records. Debbie first hired Brenda in 2005 while at Rydman Record Retrieval and placed her in charge of scheduling and producing all court reporting and videography jobs scheduled, in addition to managing a full docket of record retrieval requests. She understands the demands of the field, the necessity to confirm the court reporting job with the client and reporter, and what programs to use to get the necessary end result for the client. In 2010, after launching TLC, Debbie had another opportunity to hire Brenda and jumped at the chance. Impressed with Brenda’s ability to stay calm in difficult situations while managing her caseload and guiding her team, Debbie promoted her to Director of Operations in April 2011. Brenda works with our largest and most demanding clients on a daily basis to ensure their records are received in a timely and admissible fashion. She also has extensive experience with Texas Worker’s Compensation Subpoenas. She has created a system at TLC that ensures the documents needed in these “short-fuse” cases are in our client’s hands prior to their hearings. Brenda continues to be a cornerstone for The Legal Connection ensuring the company product is exceptional and complies with all rules, regulations, policies, and procedures. Her compassion and focus on the client’s needs makes her an exceptional Senior Case Manager and a dedicated Director of Operations. Brenda lives with her long-time roommate and friend, and enjoys watching movies and people in her spare time. Call for offices throughout the US.